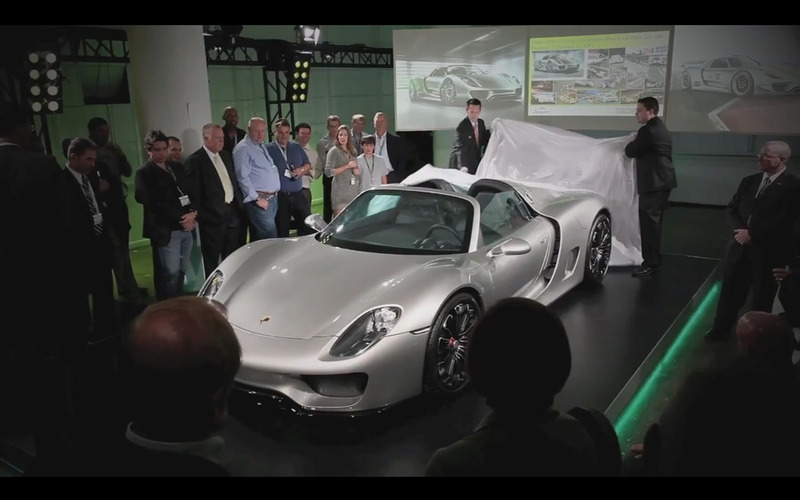 VIDEO: PORSCHE 918 SPYDER WORKSHOP – Looking forward to this in 2013-2014 Santa Claus! 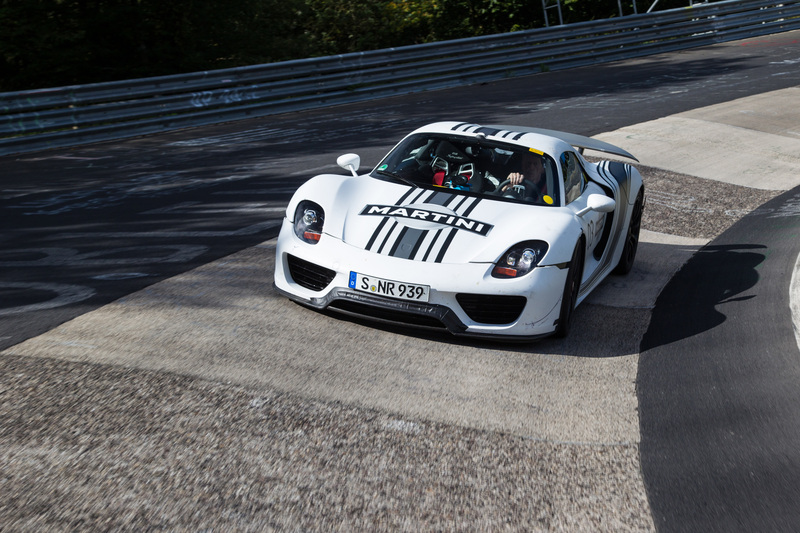 Santa Claus has visited 918 Spyder Research and Development Centre in Weissach (Baden-Württemberg) making decisions for NEXT year’s RIDE! Amazing image of the assembly workshop of Porsche 918 Spyder prototypes. It shows nine. 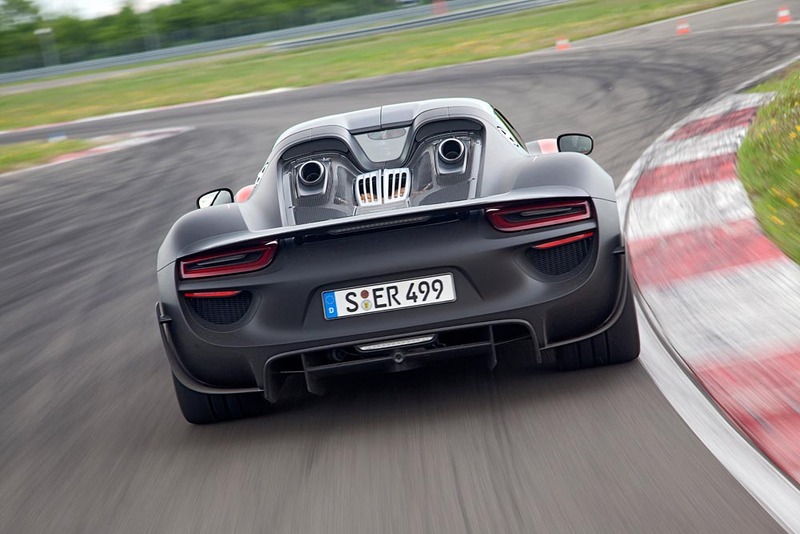 For those who follow 918 Spyder, each news is very good. 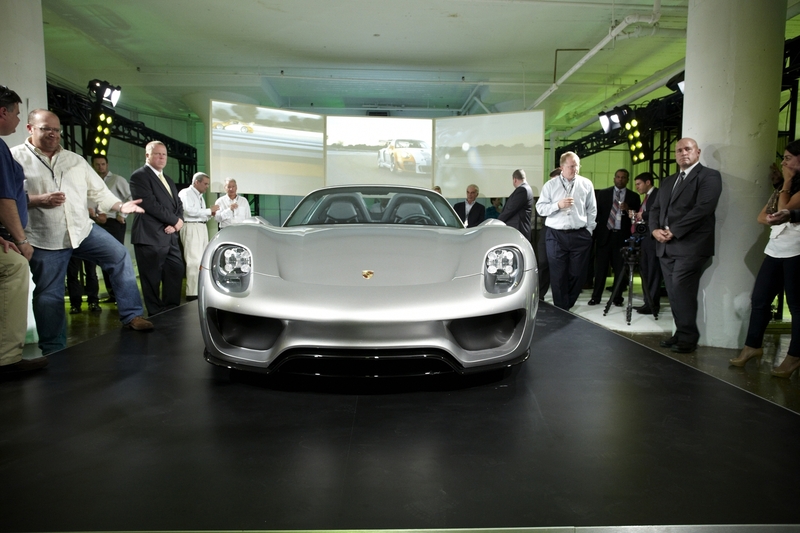 An image of the assembly workshop prototype 918 Spyder . 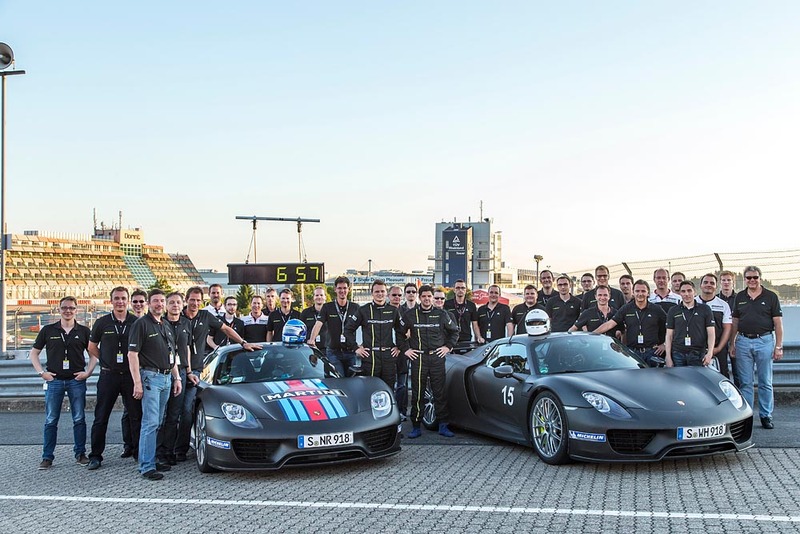 Obviously, they are not all there, but still counted nine 918 prototypes. 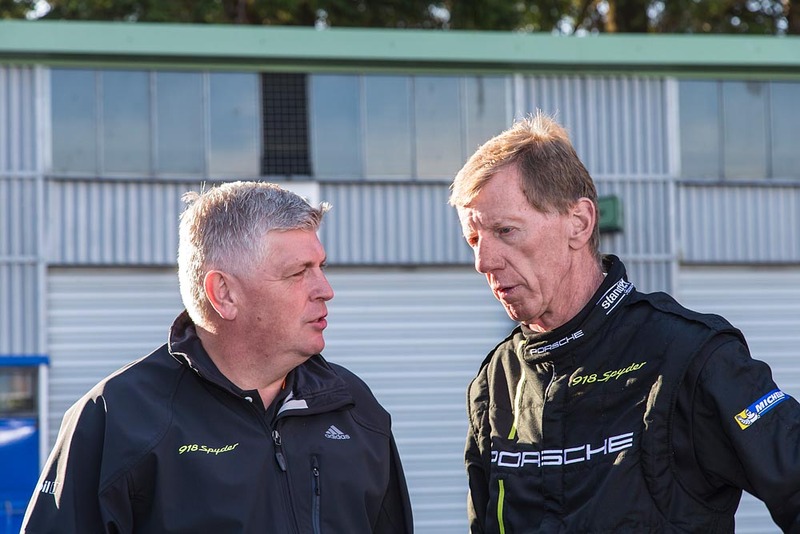 Some are equipped with supplied “Martini“, others recover 917 sets of prototypes involved in the 24 Hours of Le Mans in the past. 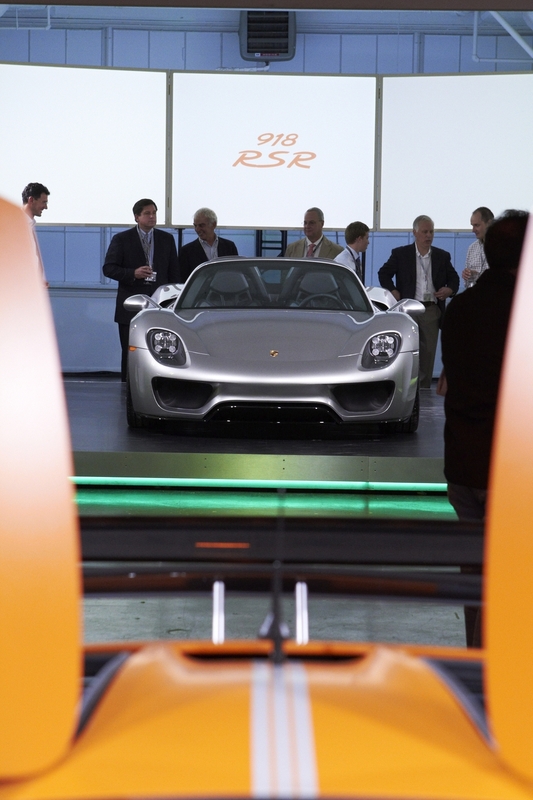 The place where all the 918 prototypes are….. The future is an exciting place, and here’s one of the people bringing it closer. 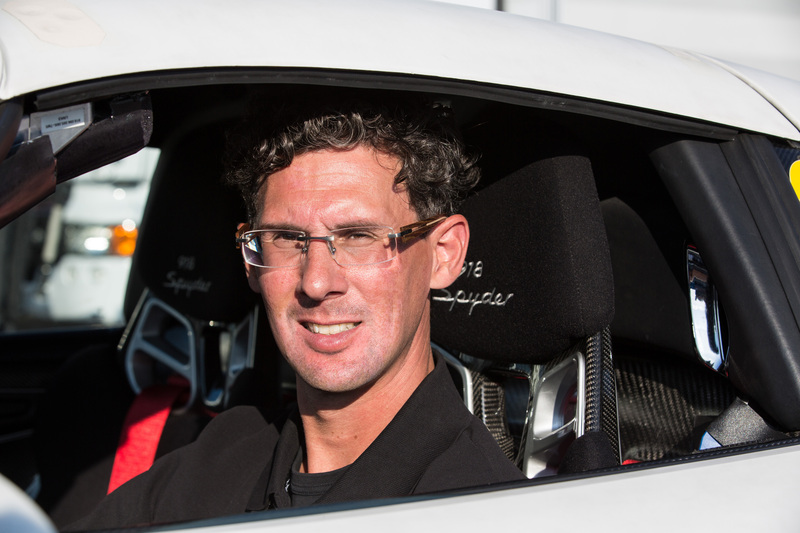 Meet Dr Frank Walliser, who takes us behind the development of one of Porsche’s most thrilling leaps in innovation, the Porsche 918 Spyder. 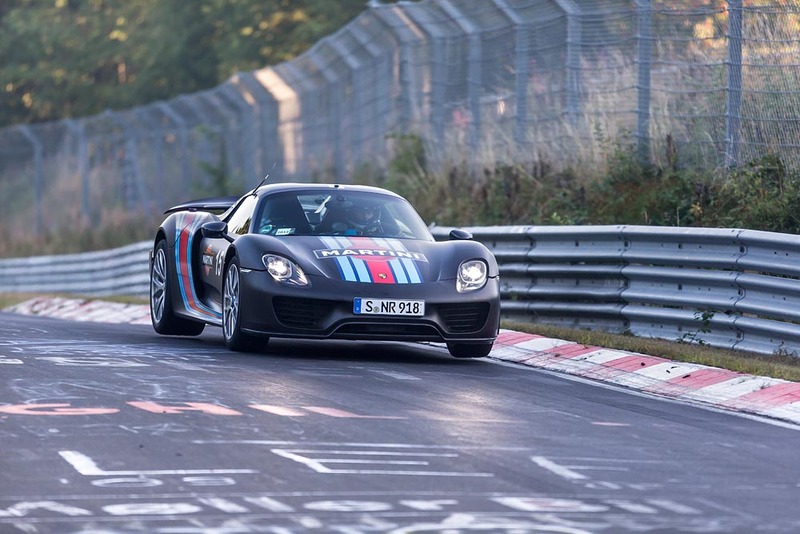 The final series of the 918 Spyder will be presented at the Frankfurt Motor Show in 2013 when the first deliveries are scheduled for the end of next year. 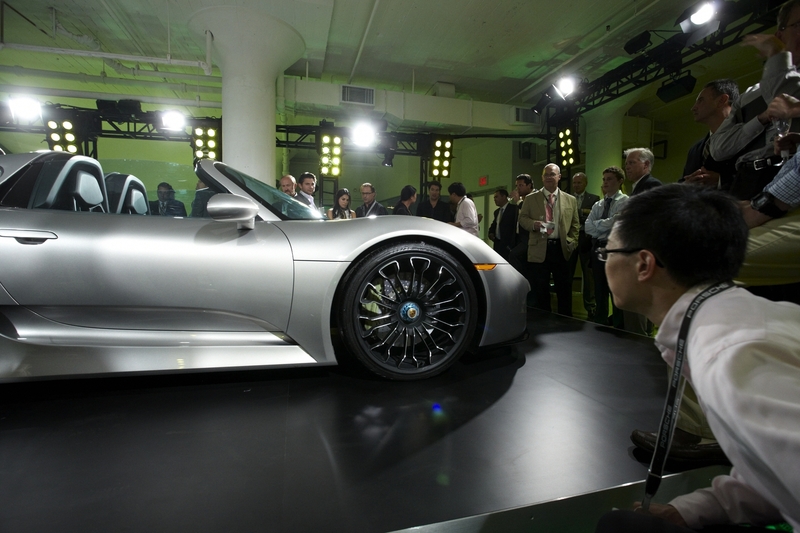 Private release NYC Party inside Canoe Studios in New York, for the “production” version of the 918 Spyder. 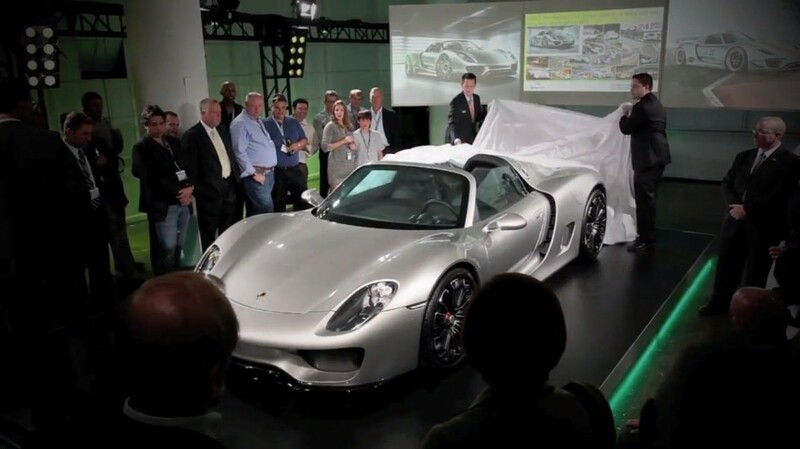 A video posted on Youtube by Canoe Studios in New York City has prematurely revealed the production version of the Porsche 918 Spyder, a hybrid supercar that was developed as a successor to the Carrera GT. According to Youtube user liquidsk8s, the video was shot at a private ceremony where would-be owners were shown the car before the general public. 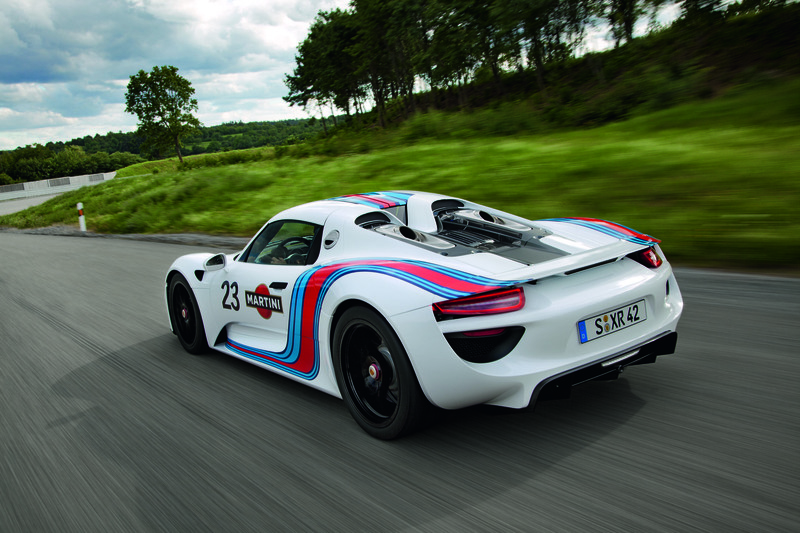 As expected, the 918 Spyder is nearly identical to the show car that was unveiled at the Geneva Motor Show in 2010. Compared to the concept the production version of the car is fitted with bigger mirrors, different door handles and side marker lights that are integrated into the front and rear bumpers. It is also a little longer than the concept that inspired it in order to accommodate a roomier cabin. 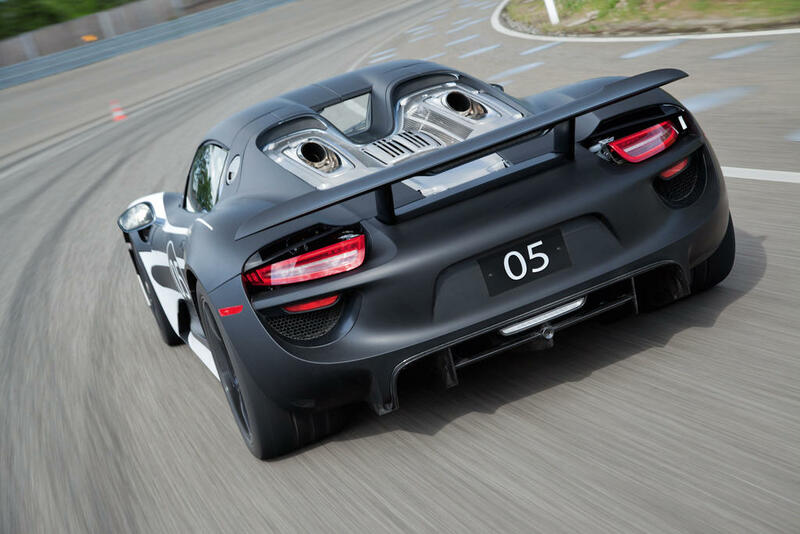 An official set of technical details has yet to be released but if the rumors are true, the 918 Spyder is powered by a 4.6-liter V8 engine that is mated to two electric motors. One of them is mounted on the front axle and the other on the rear axle. 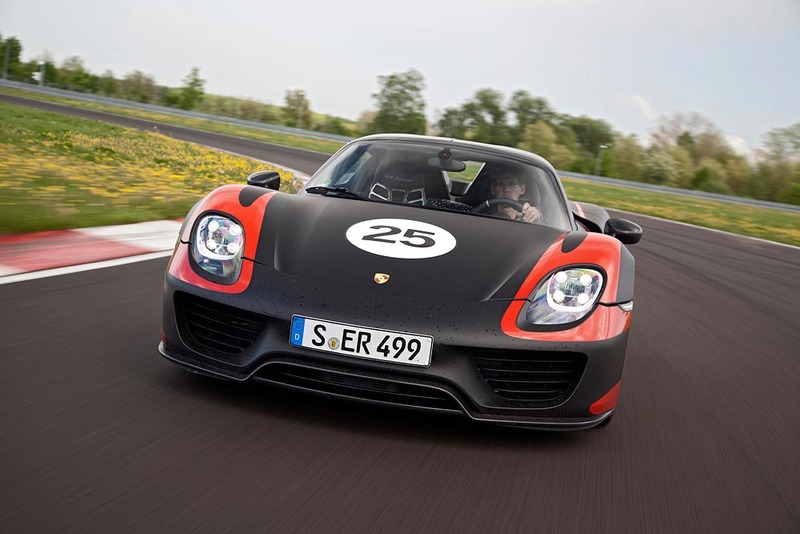 Porsche claims that the 918 Spyder delivers more than 770 horsepower while still logging up to 78.4 miles per gallon if driven conservatively. The Volkswagen-owned company’s new flagship hits 60 mph from a stop in about three seconds and goes on to a top speed of over 200 mph. 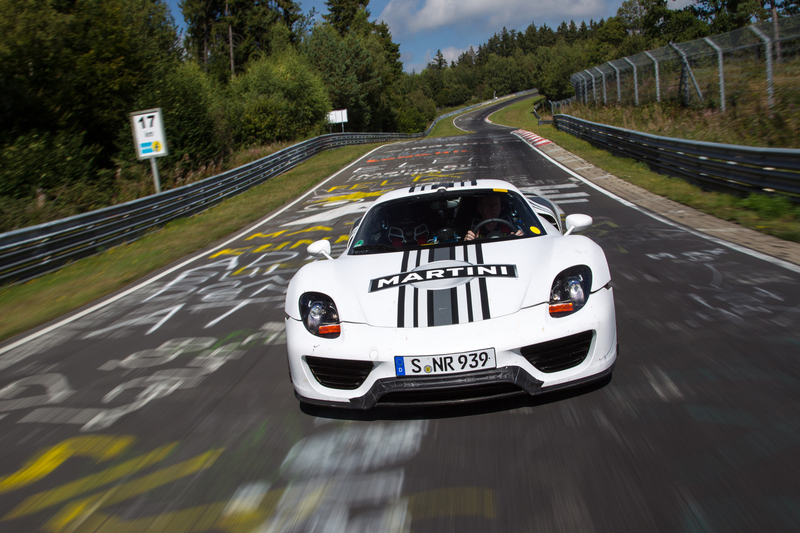 Power from the V8 is transmitted to the rear wheels via a seven-speed PDK dual-clutch gearbox. Power from the electric motors is controlled by computer and sent directly to the front wheels. 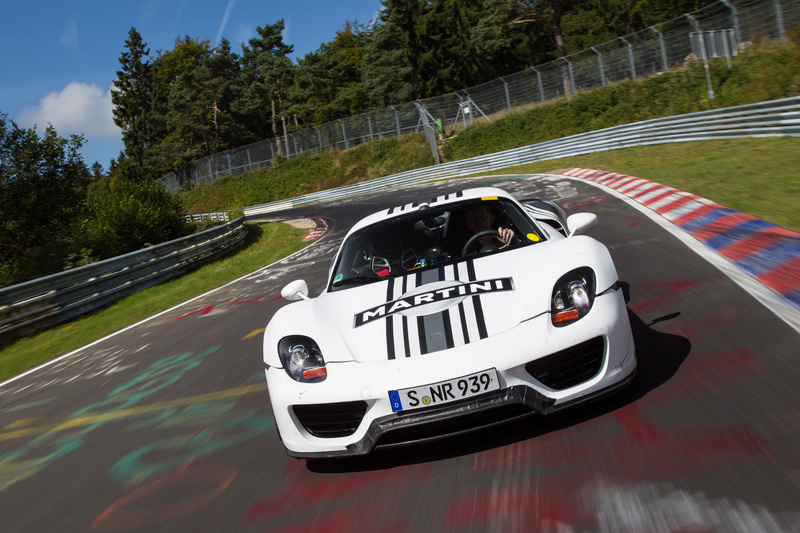 The 918 Spyder has several drive modes, offering different levels of performance and efficiency. 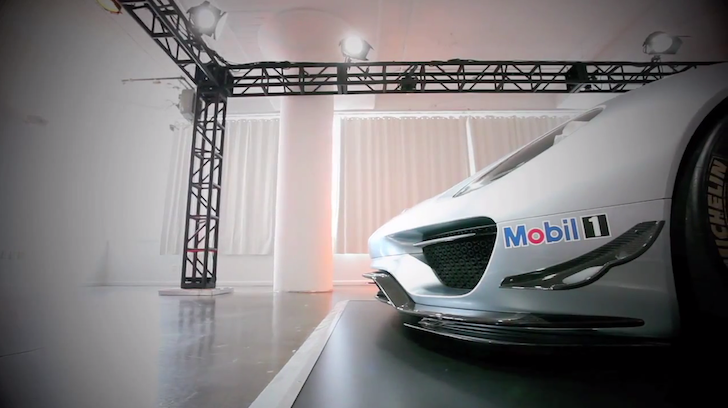 E-Drive minimizes fuel consumption by using the batteries to power the car for up to 16 miles. Hybrid mode uses both electric and gas power for a blend of efficiency and longer range. 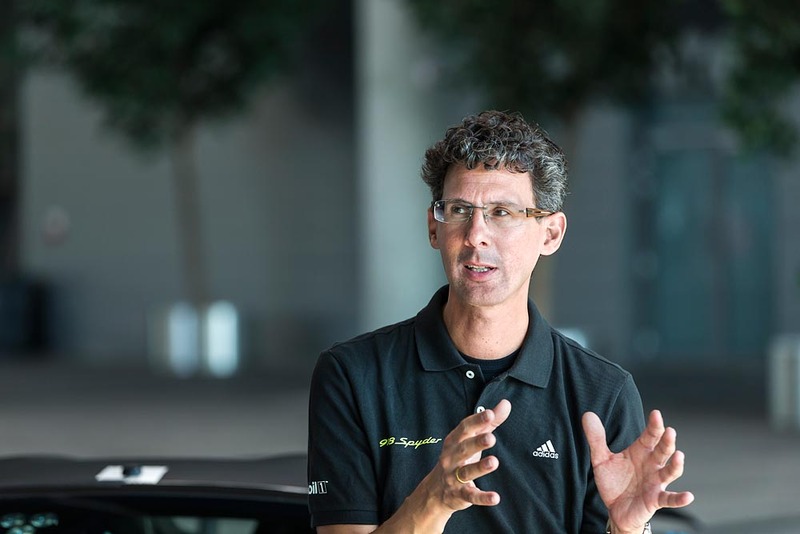 Sport Hybrid adds torque vectoring for more performance-oriented driving. And, lastly, Race Hybrid maximizes both gas and electric output, without regard for efficiency. 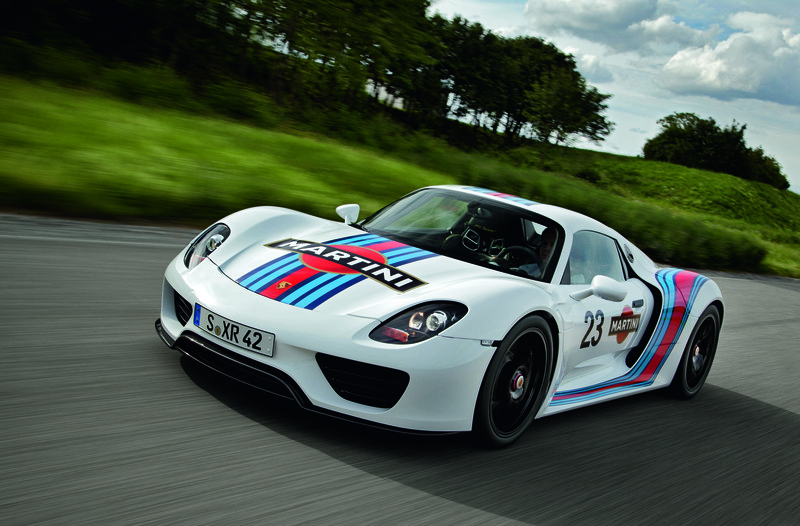 Porsche will reportedly build just 918 examples of the hybrid sports car. Pricing information will be revealed closer to its launch. Stuttgart. 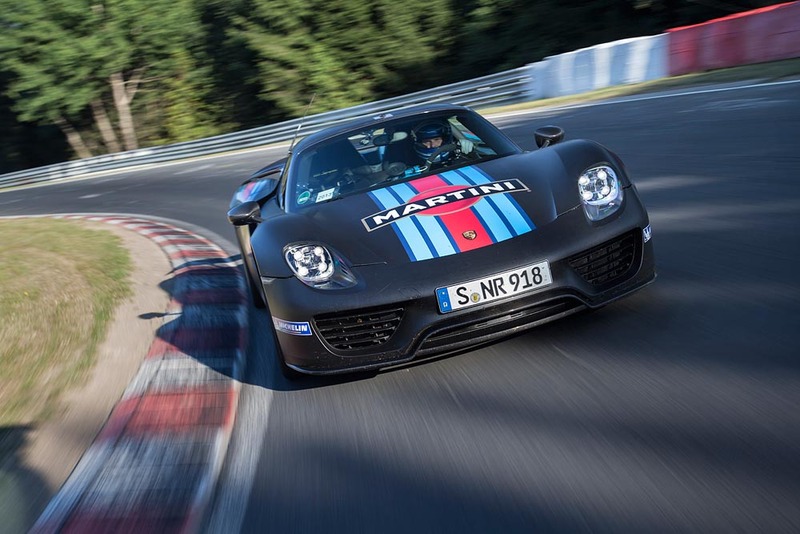 Driving trials of the Porsche 918 Spyder are entering the next phase. 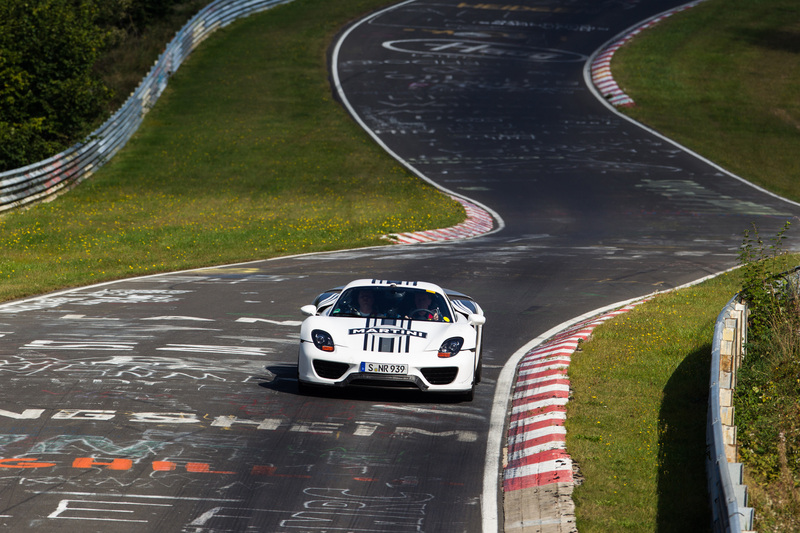 A permanent fixture of the test programme for the 918 Spyder – and in the tuning process for all Porsche vehicles – is the 20.8 km long challenging Nürburgring-Nordschleife race circuit. After all, a lap time of less than seven minutes and 22 seconds is one of the development goals of the innovative super sports car with a plug-in hybrid drive. 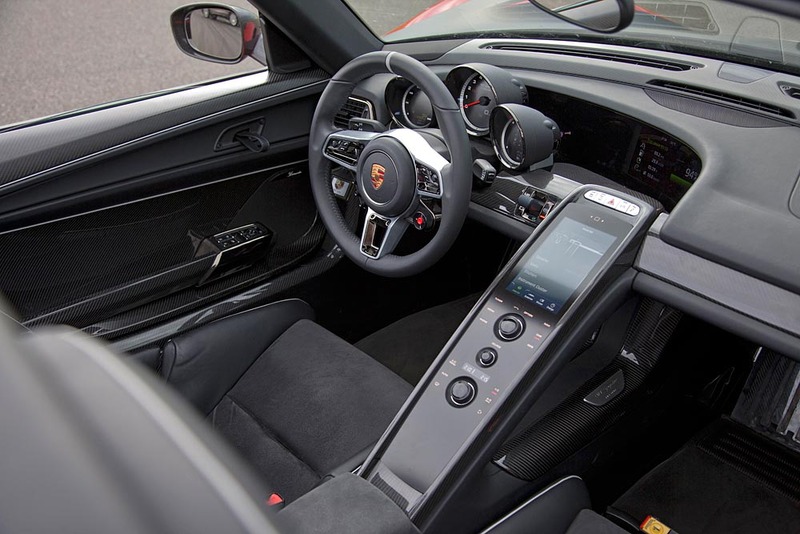 The 918 Spyder combines a high-performance internal combustion engine with electric drives at the rear and front axles to achieve extraordinary driving performance and excellent efficiency. The system power of all three drives together is 770 hp. The car’s NEDC fuel consumption is forecast to be only around three litres per 100 km, which is equivalent to CO2 emissions of about 70 g/km. The monocoque, consisting of carbon fibre reinforced polymer (CFRP), reduces the car’s weight and delivers remarkable rigidity and precision. Other highlights are the car’s fully variable aerodynamics, adaptive rear axle steering and “top pipes” exhaust system which routes the pipes upwards. 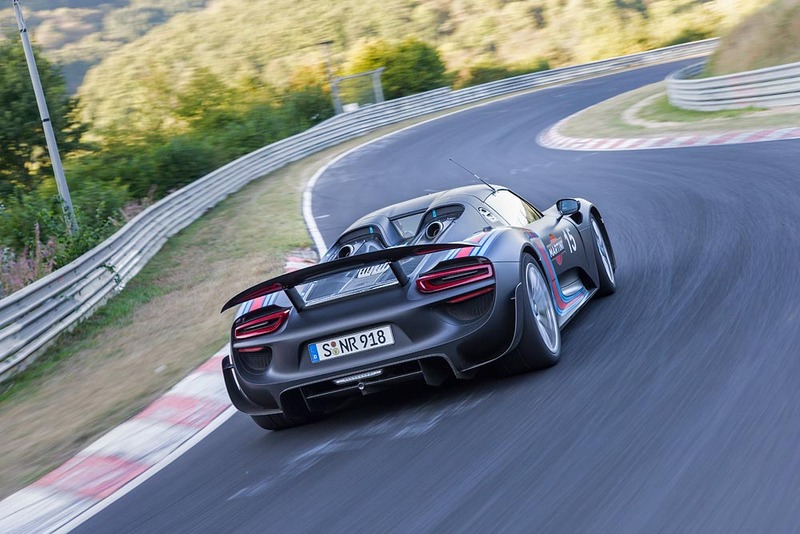 All of this makes the Porsche 918 Spyder a super sports car for the future, even though the styling of the prototypes is reminiscent of historical models. 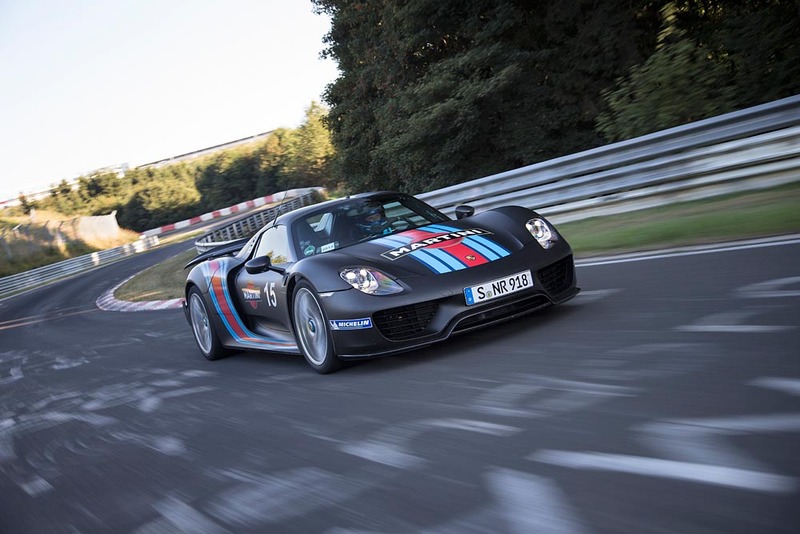 The latest test vehicle is now turning laps in the legendary Martini® Racing look of many historic Porsche race cars, particularly from the 1970s. 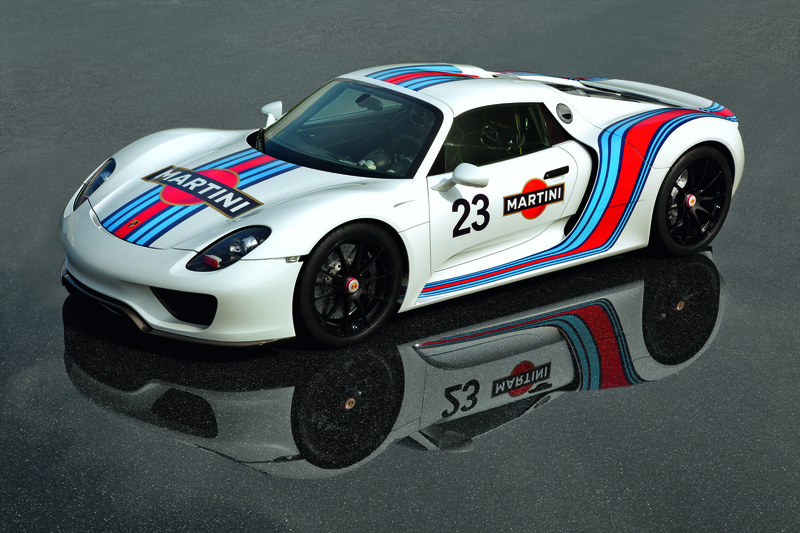 More than nearly any other race car design, the Martini® Racing look quickly attained cult status in those times and is still in vogue today. 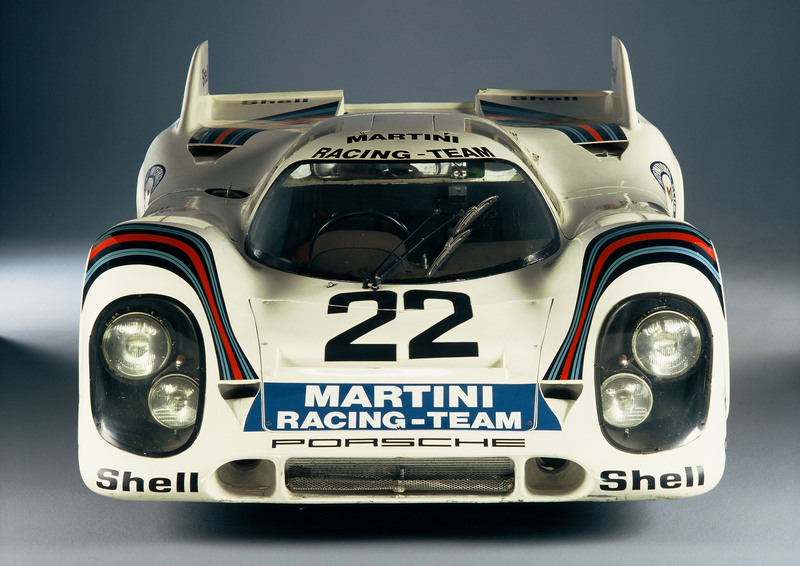 Martini® was already the official partner of the Porsche factory team between 1973 and 1978. Back then, the attractively designed “Martini® Porsche” race cars with their numerous victories were a centre of conversation. These victories included finishing first overall at Targa-Florio in 1973, winning the Sports Car World Championship in 1976 and overall victories at the 24 hours of Le Mans in 1976 and 1977. 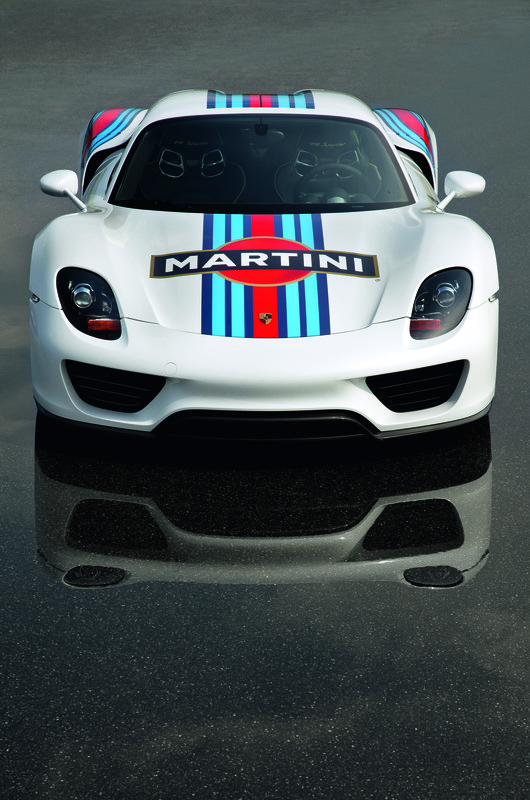 As early as 1971, a Porsche 917 finished first in the legendary endurance race in Le Mans with the support of Martini®. Whether a Porsche 908, 917, 935 or 936 or one of various 911 RS or RSR models, common to all of these race cars was the memorable Martini® Racing design implemented in a wide variety of forms. two-piece Targa roof; fixed roll-over protection system. optional electro-pneumatic lift system on front axle. recuperation; ceramic brake discs (PCCB). Stuttgart. 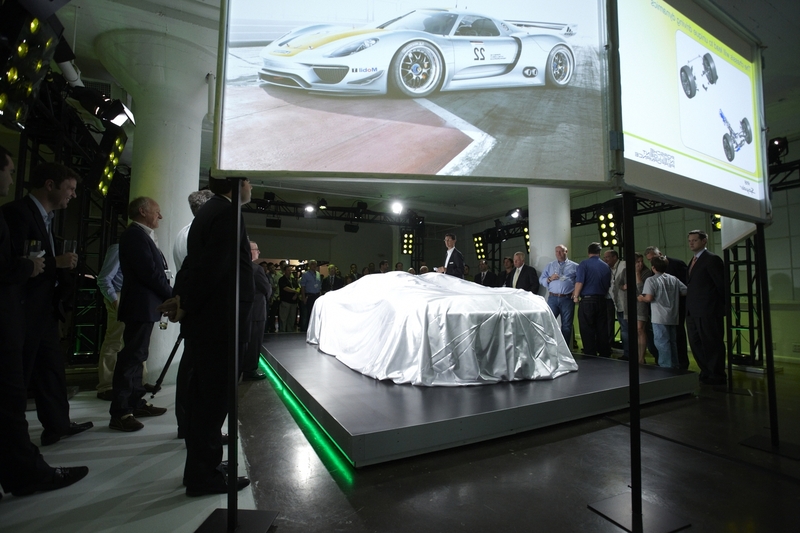 The Porsche 918 Spyder is on the road: Dr. Ing. 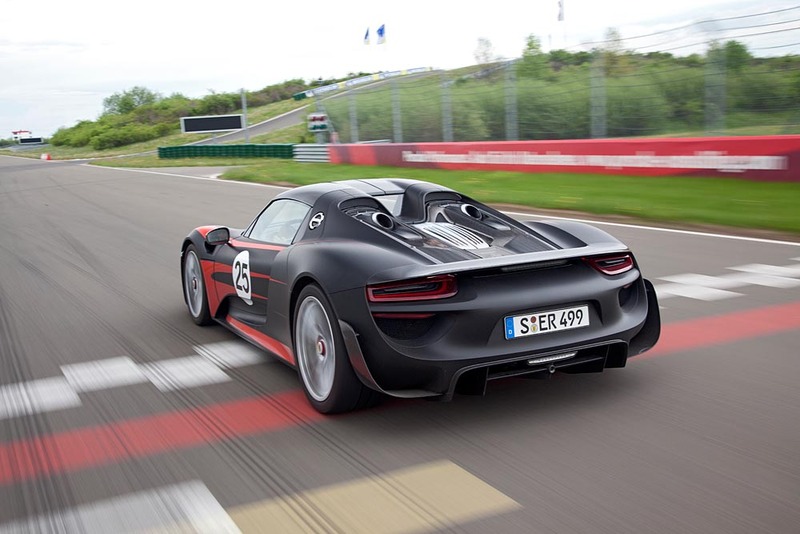 h.c. F. Porsche AG, Stuttgart, has taken the driving trials of the super sports car of the future a step further with completion of the initial prototypes. 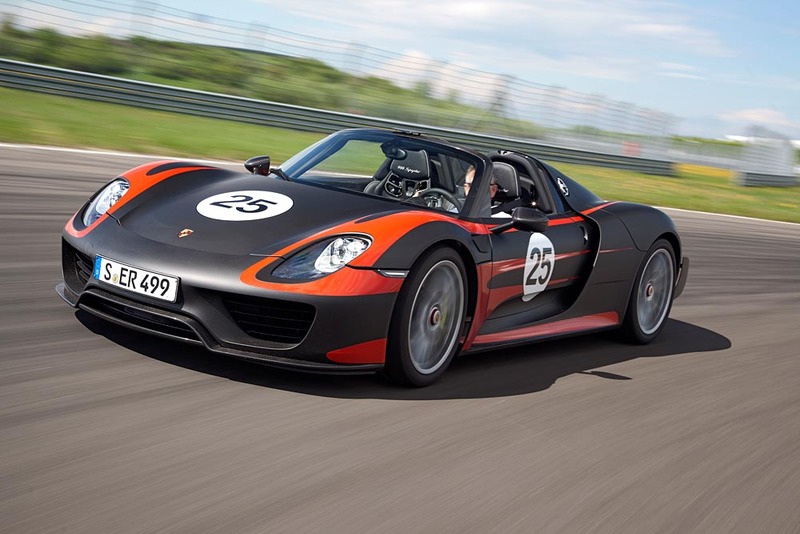 The 918 Spyder will go into production at the end of September 2013 as planned, with the first customers receiving their vehicles before 2013 is out.